Strangest thing I've come across in a while. 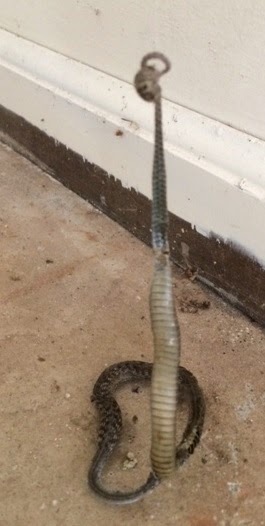 While walking through the garage of a vacant house, I found this dead snake entangled in a spider web, half the body suspended over the floor. Did recent sub-freezing weather play a part in the snake's demise, or did spidey whip up a heck of killer web? For return access, remember the "www" prefix. Some browsers may redirect to a placeholder page if "www" isn't used. Guess what happened New Year's Eve?